This area is known as Kurangee by the Eastern Kuku Yalanji Aboriginal people. Meaning place of many cassowaries. 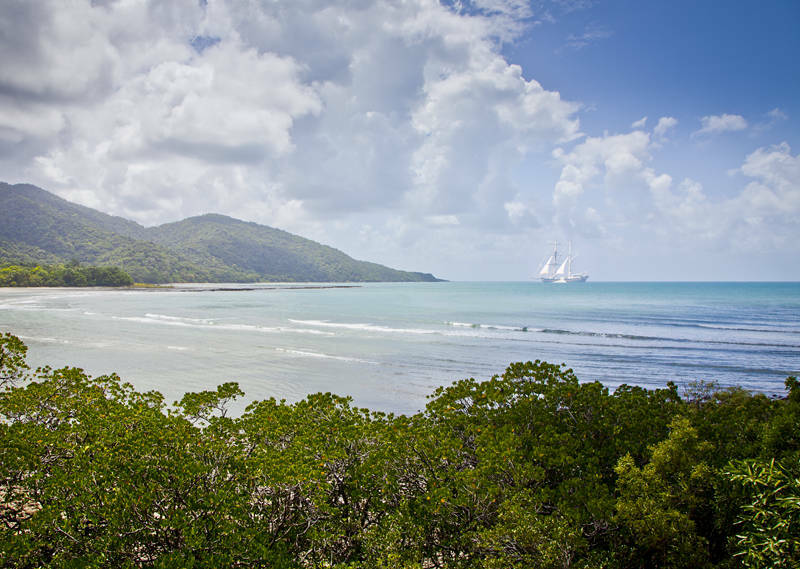 It was later named Cape Tribulation by the English explorer James Cook shortly after he discovered the Great Barrier Reef by sailing into it and creating a titanic hole in his ship the Endeavour. Only the quick thinking of one of the crew who pulled a sail under the ship to plug the hole stopped the Endeavour turning into driftwood. This single intervention ultimately ensured Australia’s fate would be forever changed. Tribulation was only the beginning. Most of Queensland’s rainforests are in pockets on remote inland mountaintops and the coral reef is far out to sea. However here in far north Queensland the mountains touch the ocean and the rainforest meets the reef. The Wet Tropics Rainforest and The Great Barrier Reef are two of a handful of World Heritage sites which fulfil all of the UNESCO criteria including extraordinary levels of biodiversity. There is so much life around this coast the number of species can only be guessed at. There are also more things that can kill you here than anywhere else in Australia. This risk of death elevates any holiday into an adventure. What is also extraordinary is you can stay in this abundant environmental paradise for less than the price of a coffee. Each state has different ways of charging for National parks. In 2013 Queensland brought in a statewide online prebook system. There are no entry or vehicle charges, only a nominal $6.55 per person per night to camp in any park. For a solo traveller, this is very attractive when compared to being packed into a caravan park where you pay the same as a family for a spot, from $25 to $60 per night. For me, there is no contest. Being able to camp surrounded by (non-human) wildlife is why I have spent more time in rainforests than anywhere else in 2018. The next stage of this continents exploration will be radically different as I am about to cross the deserts of outback Queensland. I am going to start with Burketown which is the only known location where a cloud formation called the Morning Glory regularly appears between late September and early November. I will stay until I get a good photo or run out of supplies after which I will drive the 600km South to Mount Isa.